The following is a press release from the Ministry of Tourism in the Nevis Island Administration. (November 11, 2014) — Local winners in the Florida Caribbean Cruise Association (FCCA) essay competition received cash awards from the Ministry of Tourism at a brief ceremony at the Department of Information on Monday November 10, 2014. 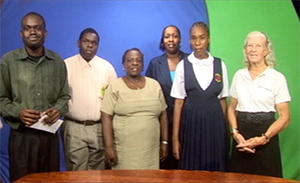 Fourteen-year-old Rol-j Williams, student of the Gingerland Secondary School and first place winner in the senior division of the competition and 12-year-old Junique Pinney, junior division winner who was a student of the St. Thomas’s Primary School but has since graduated to the Charlestown Secondary School, received their cheques from Tourism Officer Dorson Ottley. “Junique, on behalf of the Ministry of Tourism and the FCCA, I extend congratulations to you, for your victory in the junior category of the essay competition. Congratulations,” Ottley said. The Tourism Officer acknowledged that all schools across Nevis and the wider Caribbean were given the opportunity to participate in the competition. He emphasized that the Ministry of Tourism ensured that Nevis participated annually and recorded the gratitude of the Ministry to all students who participated in the 2014 essay contest. All primary and secondary school students were invited to participate in the contest. Entries were judged in two categories; a junior division for children ages 12 and under and a senior division for children 13 – 16. Essays were assessed on content, creativity, style and grammar.